hullwind | windpower in Hull, Mass. A North Shore wind-opponent has written provocatively here. He appears to agree with the web-sourced opinion that NE-ISO does NOT NEED any new generation in the coming 10 years. And some of his web-colleagues play on words by putting WIND into the middle of their made-up word s-WIND-le (‘ why windpower does not work ‘). This North Shore man has also said that he has changed from being a wind-advocate in Massachusetts. He has turned into a wind-opponent, after (as he says) studying the facts and figures of windpower, for example in Maine (as reported by FERC). If you agree with him, you might want to post something right here, — your arguments included. Just today I noticed in the Town of Hull’s annual report for 2010 (its p. 148) their muni light department reported an item of revenue, $207,512 for ‘wind turbine credits’. These are the so-called ‘RECs’, both the Federal and the voluntary sources (in Hull’s case the voluntary ones are from Harvard and from MassEnergy). Please note that this 2010 revenue figure does not take into account the approximately $415,000 of wholesale electricity — electric energy and associated capacity at approx. 7 cents per KWh — that Hull’s light company avoided buying because it had already produced them locally (or on the side of capacity, avoided the associated charges). Yes, maybe a KWh grown locally doesn’t taste that much better than one you import [contrast a homegrown tomato], but it sure has that special tang of local-pride. You may find it of interest to tune in on a particular controversy local to Hull. It was echoed in an Op-Ed piece early this year — over how to share out the overflow of dollar-benefits from Hull’s turbines. Have a look at the adjoining newspaper piece by the Chairman of Hull’s Muni Light Board. He notes that his Town Manager unilaterally decided to charge his town’s Light Dept a startlingly high “rent” for its small plot at the town landfill (i.e. $200,000/yr for each of 3 successive years, 2010, 2011 and 2012). By doing this, the Manager harvested money seven times (sic) the rents for comparable facilities elsewhere at that same time, as research confirmed. [PS, 23 Aug. 2014]. Quite incidentally, this same Town Manager, Lemnios by name, harvested in each of those three years the same number of dollars which Hull harvested from the output for this landfill-sited turbine for calendar-year 2013 [sold on the bulk wholesale market by MMWEC on Hull’s behalf]. As a matter of confirmable fact and in 2013 dollars this same machine, — pictured above on our homepage, — brought in $201,612.17 to the town during calendar 2013 ; if you doubt the accuracy of this figure, ask Mike Lynch at MMWEC, and he’ll confirm this to the penny. A negotiated settlement was only reached after “months” of controversy and meetings, Town Manager vs. Light Board. The net result leaves the Light plant pre-paid in its rent until the year 2032, just from the $600,000 now in the Town’s treasury. So this ends up being unlike the case where somebody from “outside the family” steals $600,000 from a member of our family. More like a low-on-cash and low-on-pride Uncle stealing from a Nephew — a Rich Nephew, call him. More of a comedy than a tragedy, really. Think of the value of this $600,000 (now already a few years in the Town’s treasury) if you added in compounded interest on it, projected out over a 20 yr. period. Test this. Try setting the interest rate where Mass Municipal Deposit Trust sets it. A projected interest-bearing account like that would buy you a brand-new super turbine, and install it too, maybe in Hull’s offshore waters, in 2030. So you see how it goes. You yourself are able to write some future chapters for this comedic story. You don’t even need to do much homework or stay tuned to Hull’s “Times” to get updated reports. Will this Manager or one of his successors make another raid on the bankaccount of this “enterprise” department in the coming few years ? Perhaps in the coming two decades ? If the mills keep turning, and the revenues keep flowing in on our town, — and if he or she is not a dummy, — of course Yes, the raids will be repeated ! The current Board of Selectmen will’ve been cycled out by then. Many will have forgotten the particulars of the “deal”. One of our local debates in fact heard a Selectman call the Muni Light Dept ” a cash cow”. Marblehead and Salem could use such a cow. Consider: would a similar cow have been available to Marblehead Muni Light back in 2002 ? That muni, — though it temporarily listened to Bob Joly on this point, — declined to put up a windturbine at their landfill, a good site. Strange how deliberately they refused to go forward with this, even after having gathered substantial wind data at the site. All the while Hull was cheering them on, and cheering on Gloucester, Ipswich and Salem too. All of this can easily be documented. Assemblywoman Lori Ehrlich herself knows the whole story. She even told most of the early parts of it back in 2003. She did this on an interview show on NPR (in NY State — WJFF, Jeffersonville). Or you could just ask Mark Rodgers, now of Cape Wind or Bob Shatten, a consultant to North Shore projects. These people know all the details. They’re all old-timers, from those early times of windpower’s cash cows. If you want to write further chapters in the Hull story, you’ll of course write in your customary courteous, clement and rivalry-free literary manner. I mean you’ll abstain from judging Hull’s citizens unfair or greedy (say a future Town Manager), or judging us overzealous in defending our windpower profits (like our Muni Light Company). This will put you squarely in line with the ‘epieikeis’ people surrounding Plato when he was in his 70s, and writing his famous Seventh Letter. Civility, he then preached, not irritable (the authEdEs person) rivalry. Thus no resort to prose tarnished with the tone of envy and spite. Some citizens of City Island, NY have written a preface to an untold story — about the future possibilities for their nearby landfill in Pelham Bay Park. This story brings in the Mayor of NY City. So far he has no wind-producer’s heritage to bequeath to future New Yorkers. Yet his successor in that office (due to be elected a year from now) may develop just such a legacy. The Mayor (whose origins were in Massachusetts) could afford to pop in an Devens brand of cutting-edge windturbine hardware. That would be an American Superconductor machine, rotor diameter a bit over 100m. Their High-Temp superconductor wiring lets them keep their generator startlingly light, and direct-drive lets them eliminate any heavy gearbox. AMSC’s 5MW model is already field-tested, and their 10MW model will soon be tested too (likely at sea). Both would be ready for Mr. Bloomberg to try out, by 2015 or so. Just carrying this example forward another step or two. This would locate a revenue-producer just where the City Dept of Parks is eager to re-open its 70 Acres to “passive recreational” uses — approved by the State Dept of Environmenal Conservation (DEC). The landfill is now within the confines of a City Park, and its needs to be returned by the City’s DEP. In any case, if New York City’s current mayor could find a way, he could create a major new heritage. Our prognosticaters here in Hull think one of Bloomberg’s successors in the mayoralty will do just this. Likely inside the coming 10 years. Their PLANyc has projected their needing major new infusions of energy. Where better than into a regulated grid (possibly under a Windtec system) ? You might mention this to our Massachusetts ex-patriate. Or to the people in Ayer. Will the people in Village and Town of Liberty NY press their investigations toward local windpower, public in its control and public-private in its ownership ? Quite possibly yes. A public park and a public water-supply property (no longer used) are two sites under study. The decision-makers are looking to a Wisconsin-based engineering company to strengthen their windspeed information, after which they may well seek out partners. The idea anyhow is to lead events in the Village or Town toward some happy choices: which uses should we make of the ‘spare’ $100,000 of annual revenue newly available to us as a ‘dividend’ from our shares in this benefit-minded local project ? 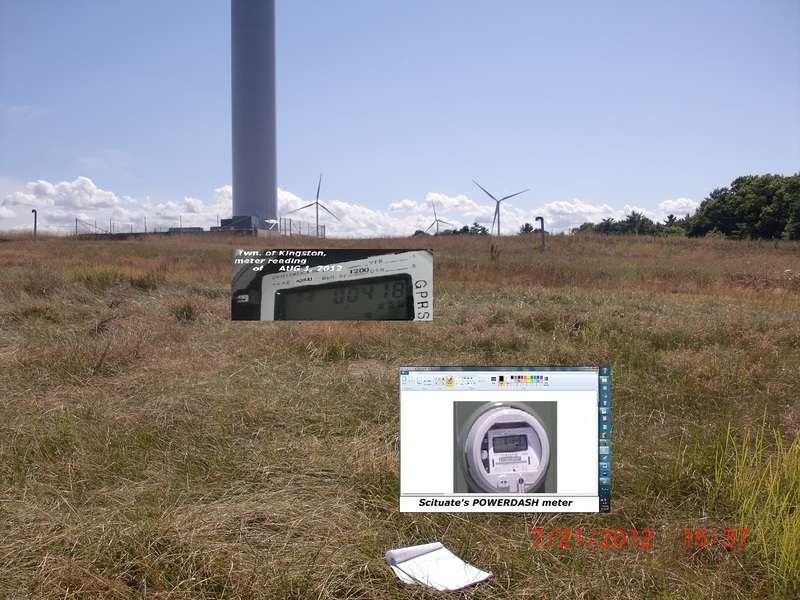 Iberdrola Renovables may want to look into all of this, as will a present-day School-Board member whose initials are J.N., or possibly the NYState Public Service Commission and its funded competition for setting up demonstration sites with european-style “micro-grids” as ways of Reforming the Energy Vision [12 December 2014]. Time will tell. There are no guarantees that anything will go forward. No, this is not a story that can be pre-written [as of May 2015]. And certainly this unfolding story cannot be written in isolation from the expected long and broad consultations with everyone concerned. Stay tuned. Tags: cape wind, city island, commercial scale, enterprise, gloucester, hull, hullwind.org, ipswich, jim gordon, Marblehead, mark rodgers, mayor bloomberg, michael bloomberg, michael bloomberg of massachusetts, north shore, Pelham Bay Park, rec's, salem, urban sited, wind, Windpower | Permalink. Kingston. As of 22 December 2012. 1658*1200 = 1,989,600 KWh’s. Is Scituate Wind Outproducing Hullwind ? We paid a visit to our neighbor Scituate, MA’s recently installed 1.5 megawatt windmill. Conveniently, we were able to read its output meter. We were curious, and likely some townspeople in Scituate will be curious too, how much energy it has produced since its inception at the beginning of April, 2012. The meter told the story, have a look for yourself (sorry our image can’t be bigger). If you can make it out, you’ll see it says “849,467” That is telling how many Kilowatt-hours of electric energy production came out between beginning of April and 21st of July. The total length of time here is 111 days. So let’s do a little processing of these numbers. Utilities measure energy to include the hours — hence Kilowatt-hours, not simply Kilowatts. On this basis, we have 849,467 (divided by) 111 days (divided by ) 24 hours giving us an average power over those one hundred eleven days = 318.9 KW. This can then be re-expressed as a percentage of the machine’s maximum (‘rated’) power output. Which in this case is 1.5 megawatts, or 1500 kilowatts. So then our final calculation is the following: 318.9 (divided by) 1500 = 21.3 %. This proves that Scituate’s new wind turbine has outperformed Hull 2 during this exact period. Interestingly enough, the Hull 2 turbine came rated at a slightly higher maximum capacity (1.8 megawatts, compared to 1.5 megawatts). So we theoretically would have found Hull’s machine outproducing Scituate’s. But many factors go into all of this, including the height above ground of the turbine’s nose-cone. Notus1 in Falmouth is at 77 meters, while Hull’s is at 60 meters. That Falmouth machine’s output is web-available at www.powerdash.com/systems/1000196. Admirable transparency there at Notus1 ! Tags: Falmouth, hull, Kingston, Scituate | Permalink. Tags: arlington, Bronx, Falmouth, Fresh Kills, hull, ipswich, jeff hydro, Kingston, Malcolm Brown, massachusetts, municipal, Pelham Bay Park, PLANyc, renewables, salem, Scituate, solaya, Windpower, wjff | Permalink.